The image of the polar bear is hard to escape these days. As Arctic sea ice rapidly melts, polar bears are losing their habitat and thus their lives, making them good symbols for those seeking to combat the impact of industrial civilization. Yet the polar bears we are presented with in public relations campaigns rarely match the animals that live in the wild. To elicit our sympathy they need to be cute and cuddly, not efficient killers with blood-stained fur, and certainly not an animal quite capable of eating us. So we are presented with an anthropomorphized polar bear that fits our agenda. What the bear needs remains beyond our reach. According to Michael Engelhard, author of "Ice Bear: The Cultural History of an Arctic Icon," this is nothing new. "Over the past 8,000 years, we have regarded it as food, toy, pet, trophy, status symbol, commodity, man-eating monster, spirit familiar, circus act, zoo superstar, and political cause célèbre. We have feared, venerated, locked up, coveted, butchered, sold, pitied, and emulated this large carnivore. It has left few emotions unstirred." In other words, we have always projected our own needs on polar bears. Those needs have evolved tremendously over time, but they remain ours. Engelhard, a Fairbanks resident, is trained as a cultural anthropologist and works as a wilderness guide in Gates of the Arctic National Park and Preserve and the Arctic National Wildlife Refuge. The combination makes him uniquely qualified to have authored this fascinating and extensively illustrated exploration of humanity's deeply complicated relationship with an animal he is well acquainted with. In his early pages, Engelhard discusses the challenge to survival that polar bears face. They are the first animal to have been classified as threatened with extinction by the United States government simply because of expected climate change. It was and remains a controversial designation, one Engelhard isn't focused on defending. What the author seeks is to discover the many ways human beings have coexisted with polar bears for millennia, and to uncover the similarities and differences in how varied cultures have understood them. 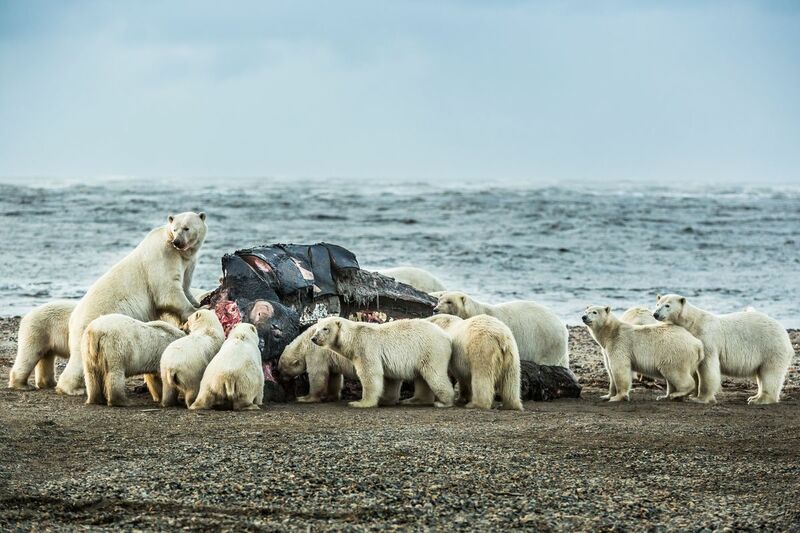 Native groups across the Arctic also incorporated being consumed by polar bears into their varied mythologies, although often in ways involving shape-shifting and shamanism. To be eaten by the bear was to become one with it and gain its powers. Or so these tales would have it. Sexual union with polar bears is another common theme running across the circumpolar north. Engelhard recounts many legends where men — and sometimes women — coupled with bears, leading to spiritually heightened offspring. Virility attached to the male polar bear was also an obsession for Europeans and Americans. During the early 20th century in particular, polar bear rugs were often included in sexualized photographs and paintings of women. Both Western and Native cultures sometimes viewed polar bears as sexual competitors for women. The fact that a skinned polar bear holds more than passing resemblance to a human undoubtedly led to many of the rituals northern indigenous peoples held about eating the animals. Engelhard reminds us that far more polar bears have been eaten by humans than the reverse, and for Arctic Natives they remain a staple of subsistence diets. The Native relationship with polar bears is its own source of consternation. Urbanized environmentalists proclaim kinship with Natives for whom polar bears are a fact of life. Yet what those living beyond the bears' range seek is a preservation that allows no room for hunting or traditional use of the animals, leading to sometimes-heated conflicts. "By distorting Natives into ecological saints and burdening them with our failures, we deny them their basic humanity," Engelhard writes, later adding, "Contradictions abound. Matters quickly get complicated." Engelhard is a product of the West, and his book spends much time exploring the trajectory of the polar bear through Western culture. The earliest European awareness of the animals appears to have come … when Norse settlers brought them back from Greenland, although it's likely the bears had previously washed up atop ice floes on Scandinavian shores on occasion. Certainly by Shakespeare's time they were well known and kept in royal menageries. Later still, they were mainstays of zoos and circuses. A must-have animal for showmen. As a test of valor for early Arctic explorers, killing a polar bear in hand-to-paw combat was a hard story to top. Here again one finds similarities with Native groups, some of which considered the killing of a polar bear the singular rite of passage into manhood. European whalers, however, came to see the bears as both pests and a source of additional income for their pelts. Polar bears were deadly to men on land, but in the water they were easy pickings, and virtual turkey shoots commenced, resulting in dozens and even hundreds being killed by ships' crews in short order. This led to the earliest stirrings of conservationist feelings, the origin of our current view of the animals. As to how our latest need from polar bears, as environmental pitchmen, will play out, Engelhard can only speculate. "With our tendency to mess things up and then try to fix them … we find it hard to accept that perhaps the polar bear's time is running out. And that ours could be too." David A. James is a Fairbanks-based critic and freelance writer.